Raids & Landings ranged from Commando style "hit & run" attacks, designed to inflict damage on the German war machine and to tie down German forces in areas that might otherwise be lightly defended to major amphibious landings such as Italy and Normandy. Operation Catapult aimed to secure the immobilisation of a squadron of the French Naval Fleet to prevent it falling into German hands. Although not a Combined Operation this naval action is included in this website because it provides useful background to British concerns about Vichy French military resources and foreign held territories. These concerns subsequently resulted in actions involving Combined Operations such as those in North Africa (Torch) and the Litani River. Operation Claymore was the 1st Lofoten Islands raid off the Norwegian coast just north of the Arctic Circle. It achieved a good measure of destruction of German ships and fish factory oil and it gave free passage to the UK to over 300 Norwegian volunteers and a few Germans and Quislings. It was, however, most notable for giving a great boost to flagging morale within the ranks of the Commandos and later the country as news of the raid was made public. Land forces - 3 & 4 Commandos. Sea Forces - HMS Queen Emma, Princess Beatrix & 5 Destroyers. This land/naval raid took place at a time of rapid changes in the fortunes of war - usually in favour of the Axis forces. The objective was to disrupt enemy lines of communication and to inflict as much damage as possible to their installations and equipment. Land Forces - A Battalion (ex No 7 Commando). Sea Forces - HMS Glengyle, a RN submarine and supporting gun ships. 09-10 Jun 41 Litani River, Vichy French Syria. The Litani River raid was, initially, a Commando operation to capture, intact, a key bridge in Vichy French Syria just prior to the arrival of Australian forces sent in to occupy the country. However, the Commando's plans was changed and while the new objectives were largely achieved, the cost in lost lives was high. [Land] C Battalion (ex 11 Commando). [Sea] HMS Glengyle. [Land} 12 Commando. [Sea] HMS Arethusa & 8 destroyers in support. [Land] 2 & 3 Commandos [Sea] HMS Prince Leopold & Prince Charles + HMS Kenya & 4 Destroyers. [Air] Bomber Command & Coastal Command. [Air] 1 Whitley Squadron. [Sea] Landing Craft & Escorts. [Land] Nos.1,2,3,4,5,9 & 10 Commandos. [Sea] HMS Campbelltown. This brief account of Operation Ironclad, the invasion of Madagascar, is taken from the viewpoint of a member of No 5 Commando. 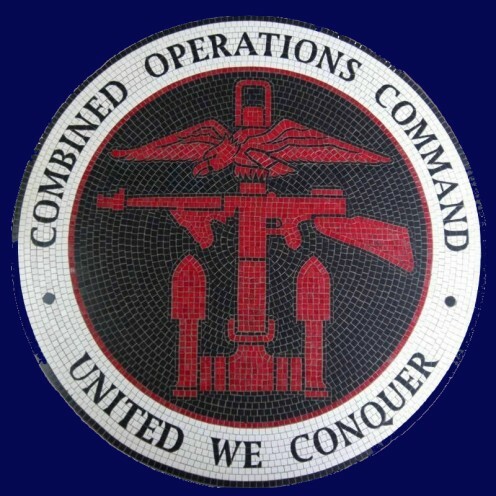 Combined Operations Command was not the principal player in this operation against the Vichy French regime - more of an assistant. The total campaign lasted 6 months but the bulk of the special work of Combined Operations and the Commandos was concentrated into a few days in early May 1942. [Land] No 5 Commando. [Land] Nos 3 & 4 Commando with 50 US Rangers, the Canadian 2nd Division. [Sea] 230 ships with 3000 men. [Air] 65 RAF Squadrons (fighters, fighter/bombers and bombers). [Land] 12 Commandos of the Small Scale Raiding Force (SSRF). [Sea] MTB 344 the Little Pisser under the command of Freddie Bourne. [Land] 2 Captains, 8 other ranks from No 2 Commando & 2 Corporals from Norwegian Forces attached to SOE. [Sea] Free French Submarine Juno. [Land] 10 Royal Marines - "The Cockleshell Heroes." [Sea] Sub. HMS Tuna. [Land] Infantry [Sea] ? [Air] ? [Land] US 7th Army British 8th Army [Sea] 2760 ships of the RN and US Navy [Air] ? A brief account of the advance from Sicily to Rome. More detailed accounts of the individual landings listed below will be added in due course. 170,000 assault troops, 5000 ships and 820 aircraft mainly from Canada, UK and the USA. In this account of this French led invasion of Elba the emphasis is on the role of the RN Commandos (Beach Commandos). This account covers the landings on the north east coast of Burma - Akyab, Myebon and Kangaw. There were set-piece battles and cat and mouse manoeuvrings on both sides with danger and death constant companions while on operations. The author's father, Sgt Alexander Pirie, MM, served in 3 Troop, Royal Marine Engineering Commandos, whose heroic efforts in clearing beach obstacles and preparing roadways are, deservedly, well documented. Thought to be a comprehensive List of WW2 Combined Operations by theatre including British, USA and Joint.